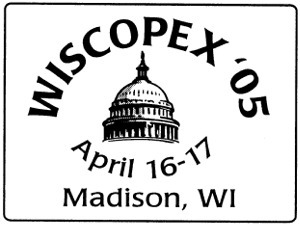 This page lists information about WISCOPEX, the annual WFSC Convention and Exhibition. The WFSC is a regional group that consists of 31 local stamp collecting clubs within and bordering the state of Wisconsin. WISCOPEX, usually hosted each year by one of the WFSC member clubs, is held at various locations throughout Wisconsin. It features the WFSC's annual business meeting, philatelic exhibits, dealers, youth activities, a Wisconsin Postal History Society meeting, and more. Visitors welcome!